Wooden staircase railings or banisters often get dirty quickly. Homeowners sometimes tend to overlook them when cleaning their homes. Dirty wood banisters can easily attract germs and can feel quite sticky to touch. That’s why thorough cleaning is a must. For many, the dilemma is how wooden banister can be cleaned without damaging the entire railing itself. Read on and find out how. Why Do Wood Banisters Need Special Cleaning? Some people ask why they can’t clean their banisters the way they scrub their floors or stair steps. Or why can’t they use strong cleansing agents to remove the grime pronto. The answer is simple: a wooden banister is too delicate. Wood banisters cannot stand harsh cleaning chemicals and rough cleaning materials. They are also prone to potential damages like scratches, deformities, and polish chipping. Hence, wood railings need gentle but effective cleansers and special handling to effectively remove rubbish and restore its cleanliness, luster, and beauty. ​Many people dust their banisters religiously several times a week. They probably think that this will render the staircase railings clean and dust-free. They get surprised whenever they touch their banisters after dusting and still find it a little sticky. ​Dusting helps remove surface dust that has accumulated on the railings. But, the truth is that dusting can never effectively remove all the dirt and grime on it. Cleaning it thoroughly using mild cleaning agents does the trick. Dusting is really never enough. ​When to Deep-Clean the Wood Banister? ​How often the banister is cleaned largely depends on how often the staircase is used. Don’t clean the wood banister too often, as this may cause the wood to soften, weaken, and get damaged when exposed to water and liquids. 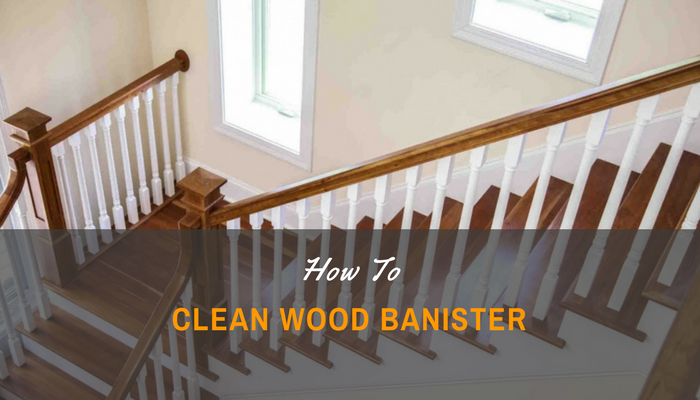 Clean the wood banister at least once a month or when grime noticeably piles up. Do regular dustings to keep the surface dirt away and prevent its accumulation. For a mild chemical cleanser, take a few drops of the dishwashing detergent or soap and mix it with some warm water on a spray bottle. Ensure that the detergent used is a mild one. Take a gallon of hot water and add two tablespoons of turpentine and four tablespoons of boiled linseed oil. The mixture must be sufficiently hot to clean effectively. Use this cleanser carefully as it can strip off paint from a colored, polished banister. Only use this on unpainted wood banisters. Mix two teaspoons of white vinegar with a cup of vegetable oil. Vinegar has antibacterial and disinfectant properties while vegetable oil moisturizes the wood surface. This concoction is a good cleanser-polisher combo. Harness the well-known disinfectant properties of vinegar by mixing one cup of it with two cups of warm. Distilled white vinegar is most preferred. This mixture’s mild and is great for both polished and unpolished wood banisters. Give the entire wood banister a nice dusting. Use the feather duster, disposable duster, or a clean piece of cloth. Do this step to remove surface dirt before you proceed with deep-cleaning the banister. If the banister is especially dirty, bits and pieces of dust and debris will abundantly show up in the duster or cloth. Select a cleansing agent that’s appropriate for the railings. Prepare it and pour into a spray bottle. Test the solution by wiping it on a very small surface to see if it’s a fit for the wood banister to be cleaned. Put on rubber gloves. Then, moisten the cloth with the chosen cleansing mixture. Wring out excess liquid from the cloth and then start wiping the wood banister to remove deep-seated grime and dirt. Use quick rubbing motions and be careful not to soak the wood with too much water. Soak the cotton buds or old toothbrush into the cleansing solution and use it to clean hard-to-reach corners, grooves, and designs. Follow-up with warm water for a quick rinse. Once done cleaning a small part, quickly spray some warm water on it and wipe off with another clean cloth. Alternatively, dampen another cloth with warm water and use it to wipe-rinse areas that have already been cleaned. Be mindful of the dirt showing up on the cleansing cloth being used. When no more dirt sticks to it, wipe the wood with the warm water cloth to quickly rinse off the cleaning solution. Once the banister is completely cleansed, allow it to air-dry. After drying, take a piece of clean cloth and buff the wood. 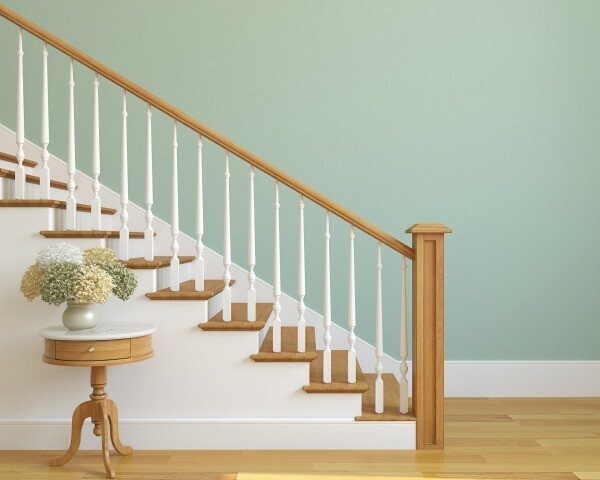 Use quick circular motions to restore the banister’s shine. Unpainted wood banisters can now be optionally painted and polished after it has been dried completely. Discard the remaining cleaning solutions and other used supplies appropriately. That’s it! The once grime-filled wood banister is now sparkly clean! The staircase will certainly look and feel better now that the grime and dirt on its railings are gone. Take these steps to heart for a clean, neat, and germ-free banister.